Wow, You’ve Got Something There! – Hot Smoked Salmon from Kaboom Box and the Art of Conversation! Each year new food carts are added to the Downtown Vancouver landscape, increasing the variety and choice us food lovers have. Despite the new purveyors, I always return to one cart – The Kaboom Box (an oldie but a goodie). This cart was apart of the first wave of licenses issued by the city and has been at it’s location on Granville street between Robson and Georgia since the inception of Vancouver’s successful street food program. There are two things about the Kaboom Box that I look forward to each time I visit: their hot smoked salmon and the conversation. I will help lost tourists and individuals navigate the streets of the downtown, providing advice when asked specific questions. However, I will admit I am one of those aloof Vancouverites that aren’t readily willing to strike up 20 minute conversations with random strangers on the side walk or on public transit. Amongst my friends, I’m can become a windbag when talking about food or hockey but out in public I clam up. Normally at a food cart, I order, step aside and wait for my food quietly. For whatever reason, that didn’t quite happen at the Kaboom Box 3 years ago. Owner Andy and chef Brian are very friendly folks, the charismatic types. They are eager to answer any questions you have about their menu and are very outgoing. The next thing I know I’m engaged in a 5 minute talk about the Canucks (I think I was wearing a jersey that day) with them. Upon each subsequent visit, if the boys aren’t busy serving other customers we discuss general topics like the weather, the street cart program, salmon, current events and of course the Vancouver Canucks. 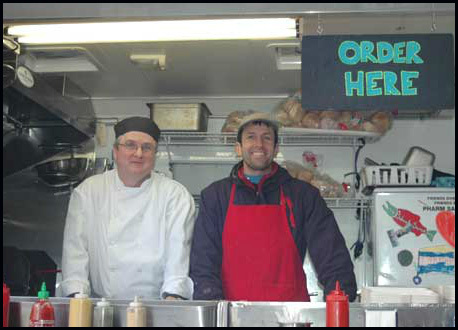 The photo below is from the Kaboom Box website, Andy is in the red apron and Brian in his chef attire. I will admit I learned quite a bit about the street food program from speaking with Andy and Brian and it made each visit better than if I just silently waited for my food. So much so I try out my conversation skills at various restaurants and food carts and it has yield a more rewarding experience. Of course, these Kaboom Box conversations would not occur at all if their smoked salmon weren’t so tasty. The salmon is smoked on the cart. It is smoky, salty and sweet which permeates the entire piece of fish while still retaining that distinct salmon taste. Normally I don’t like my salmon cooked well done because it often dries out by the time it reach that level of doneness. However in the case of the Kaboom Box smoked salmon it is still moist and tender. Sometimes, you will bite into a pocket of salmon fat which just enhances the richness and overall tastiness of the piece of fish. There are two ways to enjoy the salmon: in burger form or in their house salad. I usually go for the burger combo. 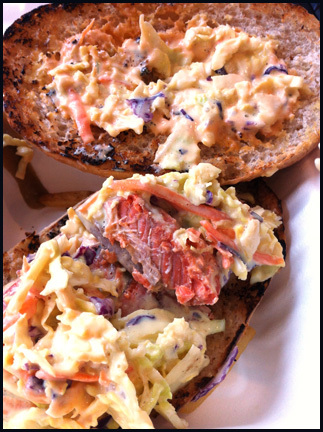 Sandwiched between a toast whole wheat bun is the salmon, a mustardy napa cabbage slaw (also contain red cabbage and carrots) and a chipotle mayo. All the ingredients work well. 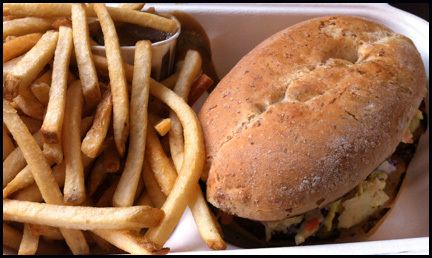 The slaw gives the burger a burst of flavour and crunchy texture. The chipotle mayo gives the ensemble a bit of spiciness. The fries are similar to MacDonald’s fries in their thinness but are much crispier. In comparison, the house salad (not pictured) is a lighter and more basic way to enjoy the salmon. The tasty salmon sits on salad greens, a few cranberries, almond slivers and is dressed in a balsamic vinaigrette. 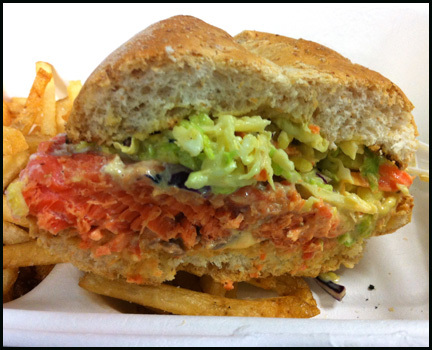 Either menu item is great way to enjoy Kaboom Box’s signature smoked salmon. I look forward to returning to this food cart for my salmon fix and to discuss all the changes that are going to happen to the Vancouver Canuck this coming offseason. We might even be talking about the dismissal of coach AV this week. Since Kaboom Box is a food truck, here’s their website and twitter account so you can better keep track of its location and menu offerings.